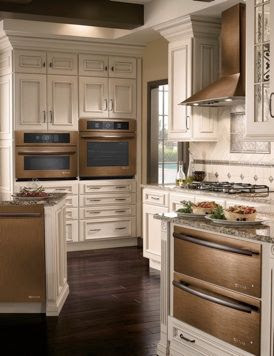 Here is a beautiful kitchen with a Bronze flare. Notice the Bronze additions to make this kitchen pop. What I liked about it: I liked the contrast of the creamy white cabinets with bronze appliances and some drawers and hardware. What I didn't like about it: The high cabinet and column will be had to keep clean. What do you think, would you love it or hate it or somewhere in between?